Does the interior of your home need an upgrade? One easy way to provide it with a new look is to add crown molding. Crown molding can be added to the areas of a room where the ceiling and wall meet and, once it’s installed, you will notice a big difference in the room. You should consider adding crown molding near Pleasanton if you are looking to make a change. Check out some ways that you can use crown molding in your home today. Most people are familiar with traditional crown molding made out of wood. It can be painted or stained just about any color, and you can even leave it natural if that matches your interior painting best. However, you can also customize crown molding to include just about any design. It will cost you more than regular crown molding, but you will get a truly one-of-a-kind look when you create crown molding designs yourself. Do you have a long hallway that would benefit from the use of dim lighting? You can install lighted crown moldings that feature soft lighting in the lower parts of the moldings. This light will face upwards and illuminate the top parts of the moldings. Once upon a time, tin and aluminum ceilings were used quite often to adorn kitchens. It’s becoming a trend again and, in addition to making the ceilings metal, some people are also opting to use stamped metal panels to make their crown molding metal, too. Your kitchen will look very sleek and modern when you install metal as one of the main components in it. 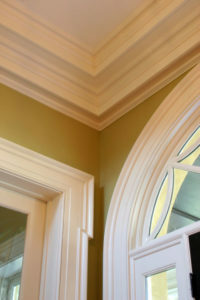 While most people install crown molding because of the way that it looks, you can also use it for functional purposes. Specifically, you can use your crown molding to run wires from one end of a room to another or to wire your entire home. Hollow crown molding is an excellent way to hide any wires you need to run.